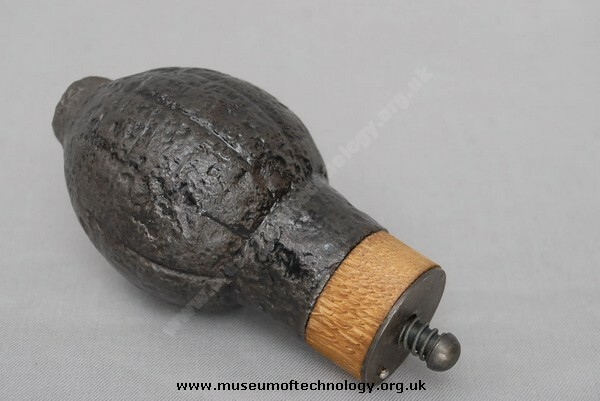 The fuze body was made of wood, holding a striker, creep spring, primer and safety fuze with a detonator. The fuze was covered by a safety cap that Has several shapes, this is missing. Before throwing, the cap was removed and the striker was to be hit on a hard surface. Similar in operation to the Mills Bomb, Which is safer is debatable. At least if the french model was dropped without hitting the striker it would not explode, not so with the mills once the pin had been removed. "Foug" may refer to "fougasse". This is by no means as safe as the Mills. Developmentally it equates with the Battye in that the user necessarily has a smoking grenade in his hand until such time as he can dispose of it. The citron is initiated by striking the head on a hard object, whereupon its discharge is a foregone conclusion. The Mills on the other hand, is not initiated until such time as the lever is released upon the grenade leaving the user's hand. Until that moment, the pin may be restored at any time or the base plug and detonator removed to make it safe. As between the two, the probable impact of the thrower becoming incapacitated mid-throw is roughly equivalent, except that the user of a Mills has a chance if he holds on tight, whereas the user of a citron, once initiated, has none. The citron was a successful grenade. Used in the Middle East until the 70s apparently.